1.4.2. What is a List? 1.5.2. What is a Data Tree? 1.6.1. What is a Mesh? In this example, we will use some of Grasshopper’s tools for manipulating data trees to retreive, reorganize, and interpolate the desired points contained in a data tree and create a lattice of intersecting fins. Sweep with two rails to create a NURBS surface. 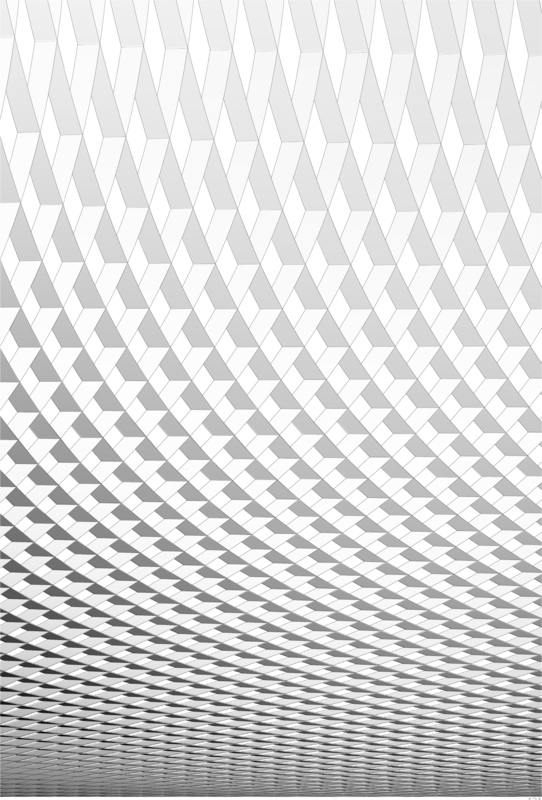 Divide the surface into variable sized segments, extract vertices. Data comprised of one list with four items in each segment. Flip the matrix to change the data structure. Data comprised of four lists, each containing a single corner point of each segment. Explode the tree to connect corner points and draw diagonal lines across each segement. Prune the tree to cull branches containing insufficient points to construct a degree 3 NURBS curve and interpolate points. 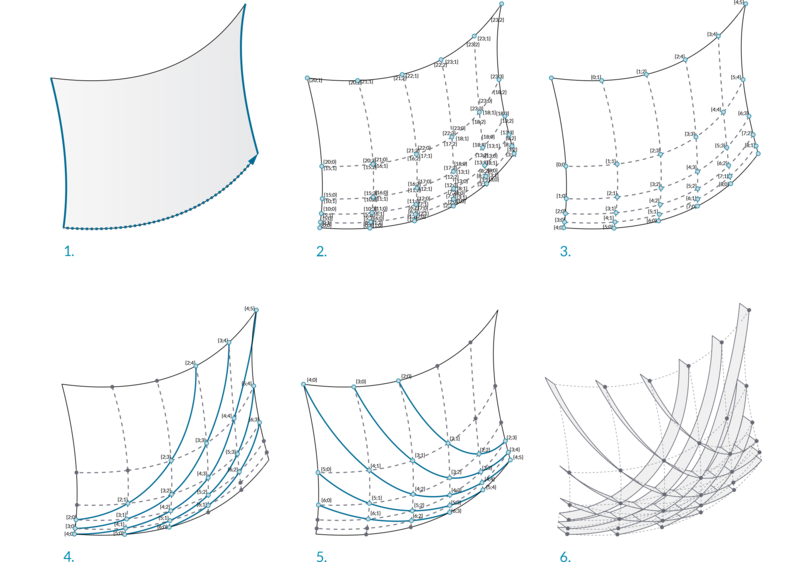 Extrude the curves to create intersecting fins. 10. Right-click the Surface parameter and select “Reparameterize”. In this step, we re-mapped the u and v domains of the surface between 0 and 1. This will make future operations possible. We have now divided out surface into smaller, equally sized, surfaces. Adjust the U and V Count sliders to change the number of divisions. Lets add a Graph Mapper to give the segments variable size. 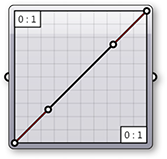 The Merge and Split components are used here so that the same Graph Mapper could be used for both the U min and U max values. We have just deconstructed the domains of each surface segment, remapped the U values using a Graph Mapper, and reconstructed the domains. Adjust the grips of the Graph Mapper to change the distribution of the surface segments. Let’s use Data Trees to manipulate the surface divisions. 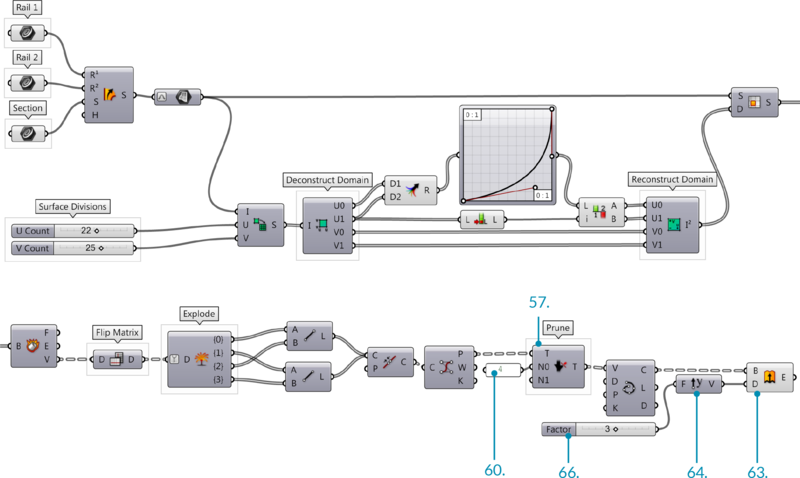 The Deconstruct Brep component deconstructs a Brep into Faces, Edges, and Vertices. This is helpful if you want to operate on a specific constituent of the surface. We just changed the Data tree structure from one list of four vertices that define each surface, to four lists, each containing one vertex of each surface. Each output of the Explode Tree component contains a list of one vertex of each surface. In other words, one list with all the top right corners, one list with all the bottom right corners, one list of top left corners, and one list of bottom left corners. We have now connected the corner points of each surface diagonally with lines. We have now joined our lines into polylines and reconstructed them as NURBS curves by interpolating their control points. In the Rhino viewport, you might notice that the shorter curves are still straight lines. This is because you cannot make a degree three NURBS curve with fewer than four control points. Let’s manipulate the data tree to eliminate lists of control points with less than four items. If you connect one Param Viewer to the Points (P) output of the Control Points component, and another to the Tree (T) output of the Prune Tree component, you can see that the number of branches has been reduced. 60. Double click the Panel and enter 4.